One of the most photographed spots on Mackinac Island is Arch Rock. 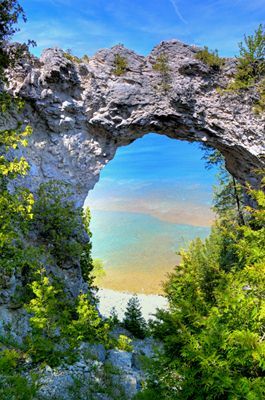 This geological wonder a natural limestone arch formed during the Nipissing post-glacial period when high Lake Huron levels and wave action created openings in the rock. Arch Rock stands 146' over the Lake Huron shoreline--nearly 15 stories tall. In Anishinaabe-Ojibwa tradition, the Great Creator blew the breath of life into the newly formed earth and created Arch Rock. Like nearby Devil's Kitchen and Sugar Loaf, Arch Rock's limestone formation took thousands of years by wind, water and receding glaciers to be created. It is made of breccia limestone, a rare limestone for the Great Lakes. The limestone formation was so unique that it was one of the reasons early Mackinac Island residents lobbied for the island to become Mackinac National Park in 1875. The views from Arch Rock are dramatic. Sweeping views of Lake Huron and Canada make this a great place to enjoy. Arch Rock is located on the southeast portion of the island and is accessible via carriage or bike. It is an easy walk from Fort Mackinac. From the lakeshore, Arch Rock can be reached by stairs. From Fort Mackinac, continue on bike or foot along Arch Rock Road.